Owning the premium sector in prosperous times has been good business for Shell whose branded fuel ‘V-power’ is the fuel of choice for drivers who aspire to the F1 Ferrari dream. In times of austerity however real world realities set in and have resulted in the new ‘Fuel Save’ 95 petrol grade. Look at how discount grocers Lidl and Aldi have grown in times of recession with low cost own branded products it becomes clear that Shell’s strategy with Save’95 makes total sense. 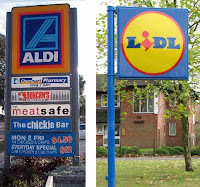 If Lidl and Aldi are role models then will we see their trademark austere exterior and interior designs being applied to other familiar roadside brands? Will Mercedes and BMW drivers accept such an imposition? According to Lidl UK director Martin Bailie as reported in FreshPlaza.com such ABC1 customers are a growing market segment for discounters whose associated brand stigma ‘has all but disappeared’. Will we see the rebirth of the failed Save brand of petrol stations and Price Watch initiatives? Ask any of the petrol retailers at the March 2010 PetroForum in Kuala Lumpur you would find that achieving lower running costs was no 1 on their agenda. General Abd el Salam chairman of Watania Petroleum in Egypt for example explained that any incremental improvements to a petrol station design could not exceed his existing budget. SeaOil too in the Philippines were preoccupied by the impossible task of how to apply their canopy decoration to galvanised steel sheet as opposed to the silky finish that can be achieved with an Aluminium Composite Material. It’s not just the fuel and grocery market where we are seeing the save mentality, for example KFC’s budget $9.99 meal deals for four proves ‘Food to go’ is very much in line. This is not to say that the premium sector is dead. Mid to premium grocer Waitrose in the UK is bucking the downmarket trend but perhaps it’s a market reversal that sees the saver sector grow to become the overwhelming market segment and mid to premium shrink to a niche….and as a significant footnote, not all markets are creating austerity brands as its the more mature markets that have been most hit by the current recession.